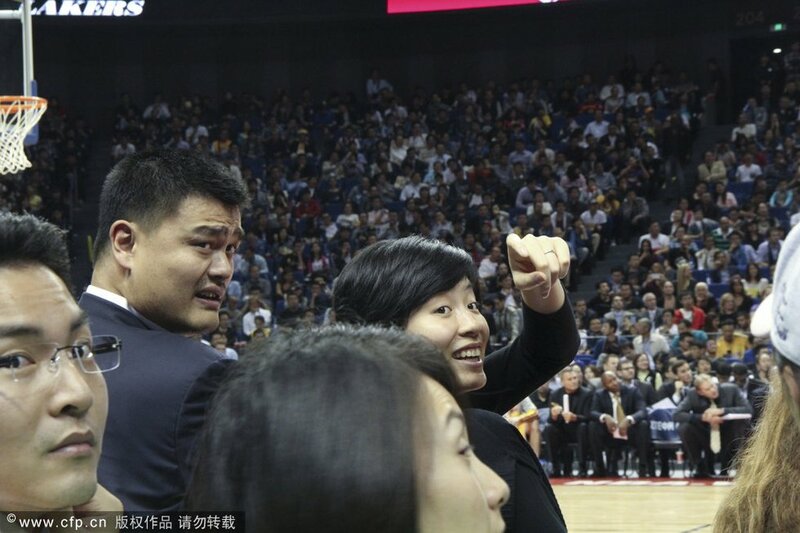 And yesterday, Amy Yao Qinlei was there too at the NBA Cares/Open Day fans gathering together with Big Yao. 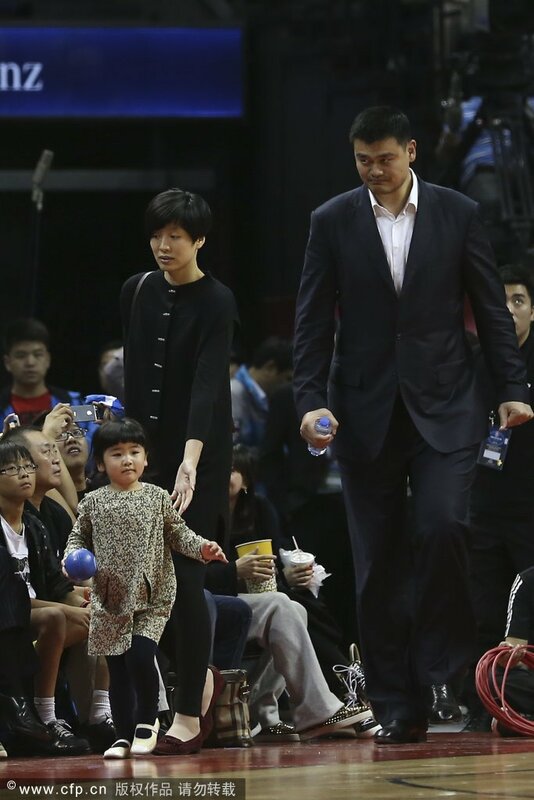 So Yao Ming lived up to his promise of bringing along/exposing his daugther to more of his future philanthropist/charity events. Here are some photos of the cute and lovely Amy Yao Qinlei. 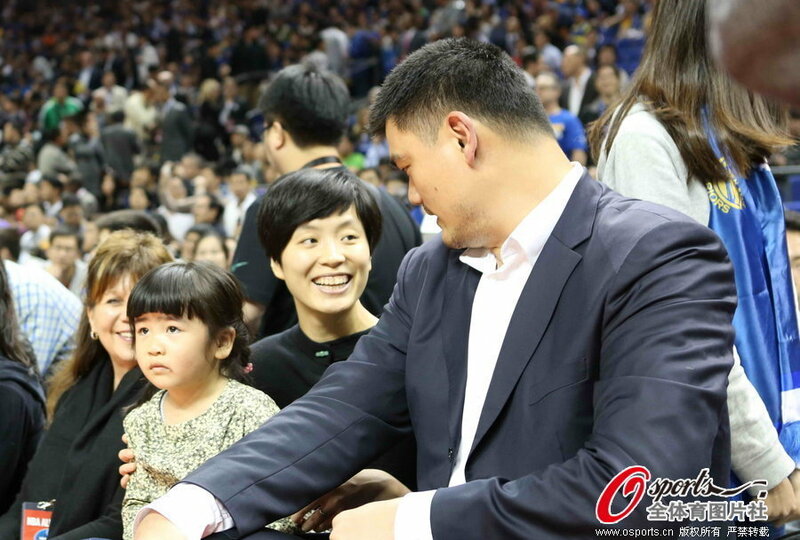 Amy Yao Xinlei showed her face again (and was the focus of attention) last night when Yao Ming and Ye Li brought her along to watch the preseason game between LA Lakers and Golden State Warriors in Shanghai Mercedes Benz Cultural Center. 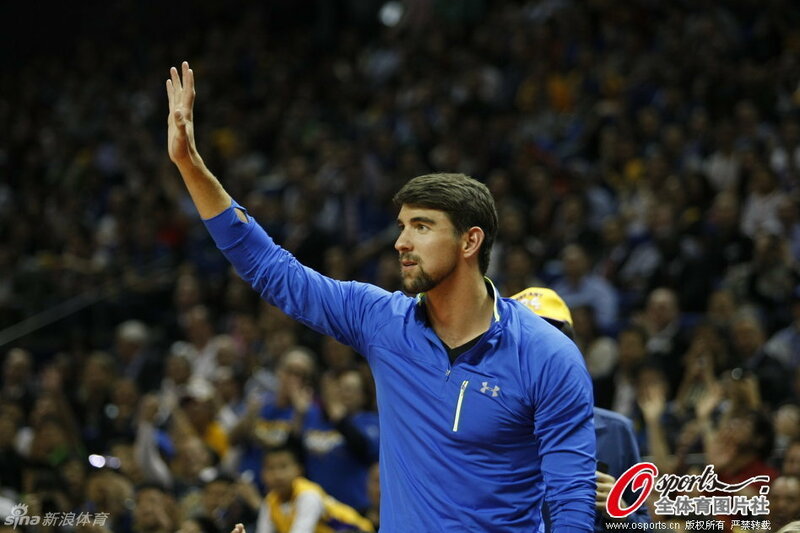 Quite alot of celebrities were there last night including Michael Phelps. 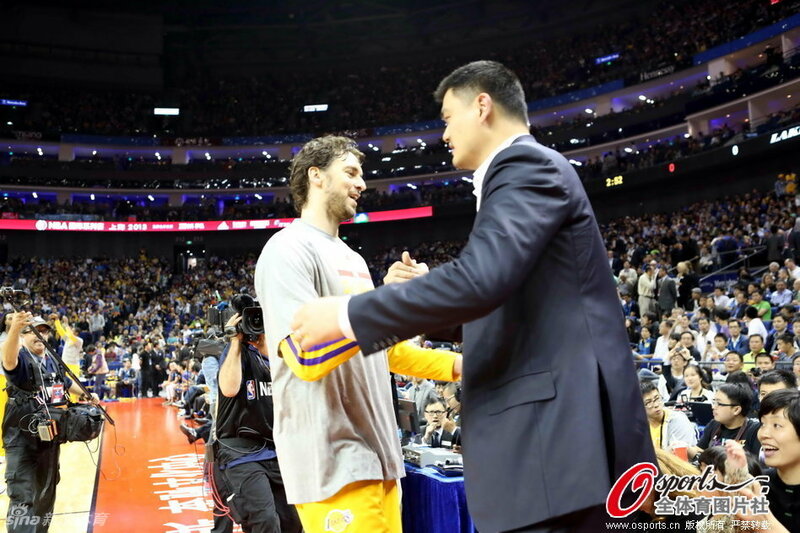 LA Lakers was clean swept by Golden State Warriors in their China series, and was humiliated 89 ~ 115 last night. The only piece of good news for LA Lakers fans was that Kobe Bryant was seen running and practicing shooting some hoops during the pre-game shootout for the first time in 6 months after his injury last season. 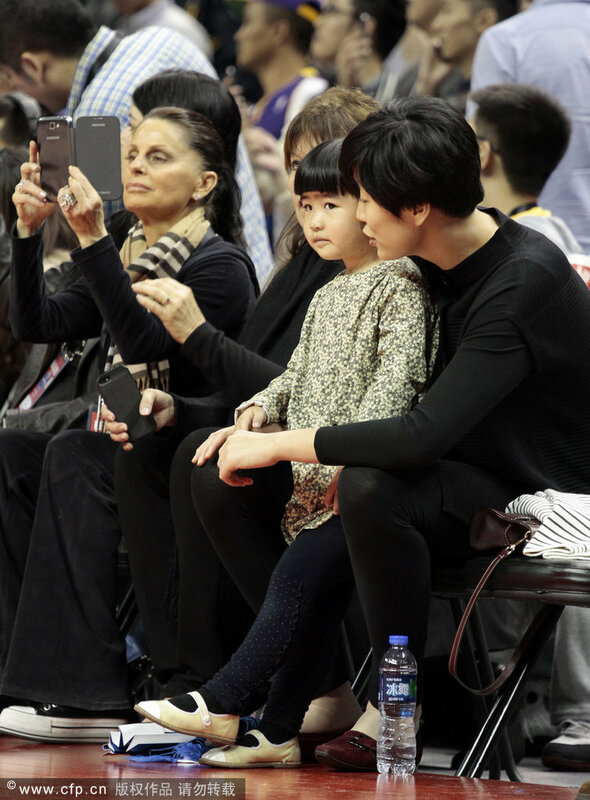 Here are photos of Amy Yao Xinlei and her parents at last night's game in Shanghai Mercedes Benz Cultural Center. 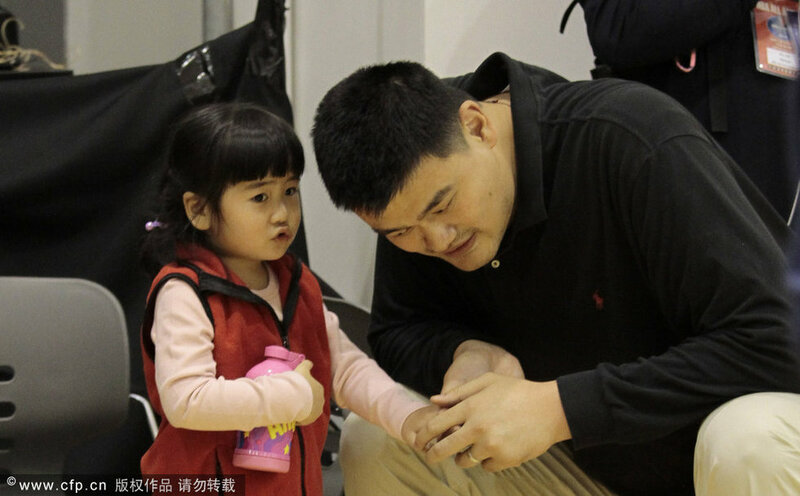 Yao Ming should reform the CBA system, the sports system in general and also the child policy. Comeon, just do it, the Chinese government needs to act now. NOT TOO SURE ABOUT YOU....but this photo brought back to me some nostalgia of the years gone by. Tracy McGrady met up with Yao Ming in Shanghai yesterday and he posted this photo onto his sina.com weibo. I consider this guy a brother to me. 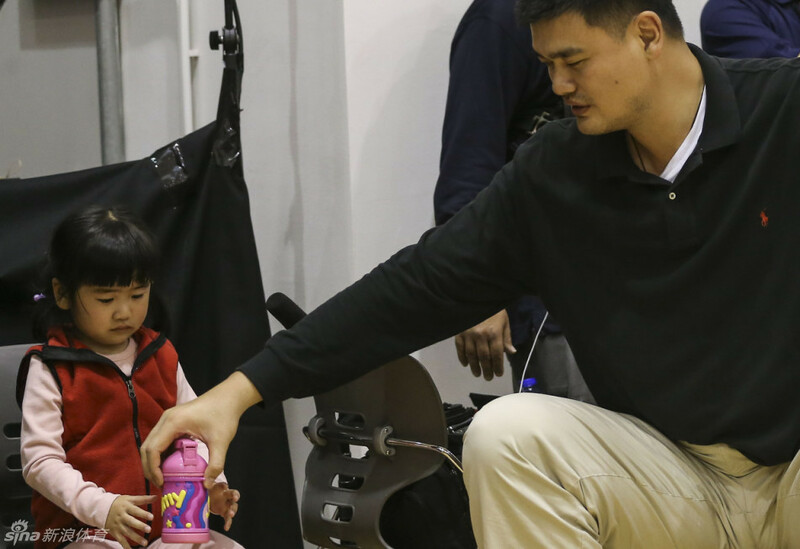 Having a great time in Shanghai with Yao Ming. Tracy McGrady was in China last week; he arrived Beijing early Friday morning; he was invited as a guest commentator by LeTV for Game 5 of the CBA Final between Beijing Jinyu Capital Steel Ducks and Xinjiang Guanghui Flying Tigers in Beijing on Friday night, March 28th (of which almost everyone thought Beijing Jinyu Capital Steel Ducks would have won and crowned CBA Champion that night in MasterCard Centre aka Wukesong Arena in front of 18,000 frantic home crowd). Of course we knew Beijing Jinyu Capital Steel Ducks screwed it up, and did not win until Game 6 in Urumqi on Sunday night. Anyway, Tracy McGrady continued touring some other cities and was in Shanghai yesterday. 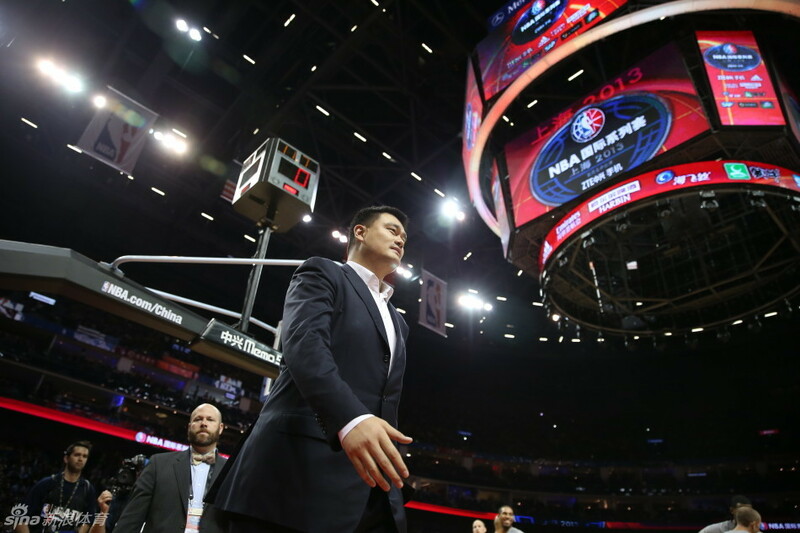 Luckily Yao Ming had just come back from another visit to USA and was in Shanghai, and Yao Ming hosted a dinner for Tracy McGrady in a restaurant overseeing the famous Shanghai Bund. Tracy McGrady was in China last week; he arrived Beijing early Friday morning; he was invited as a guest commentator by LeTV for Game 5 of the CBA Final between Beijing Jinyu Capital Steel Ducks and Xinjiang Guanghui Flying Tigers in Beijing. 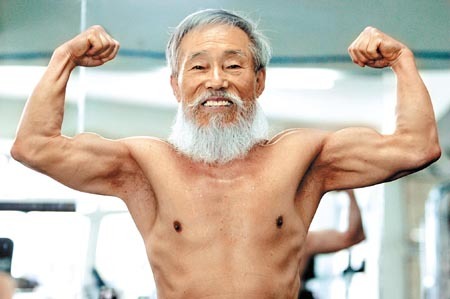 wahahaha, pryuen, have you got your 70" LeTV yet? 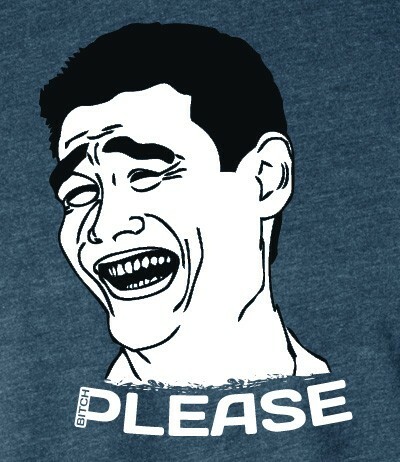 Remember that you refused to discuss about the 60" LeTV, claiming that it was obsolete? But then no consumer in the world have used the 70" LeTV since it was not even on the market yet. 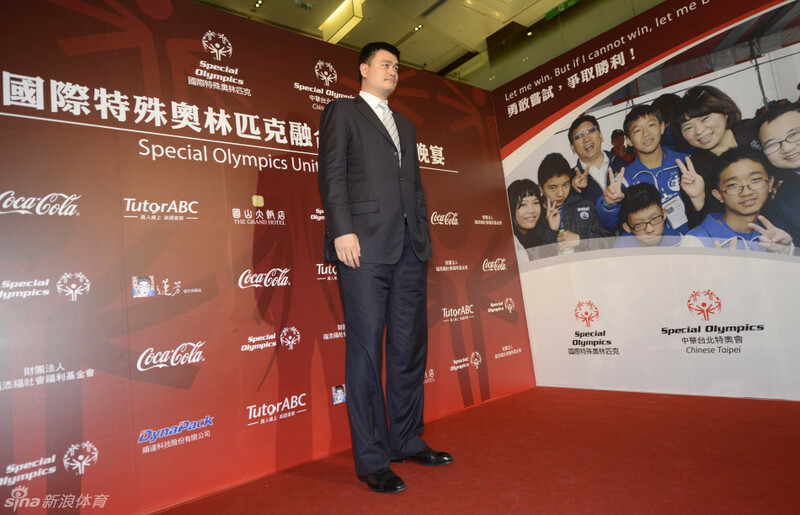 Yao Ming was in Taipei yesterday. 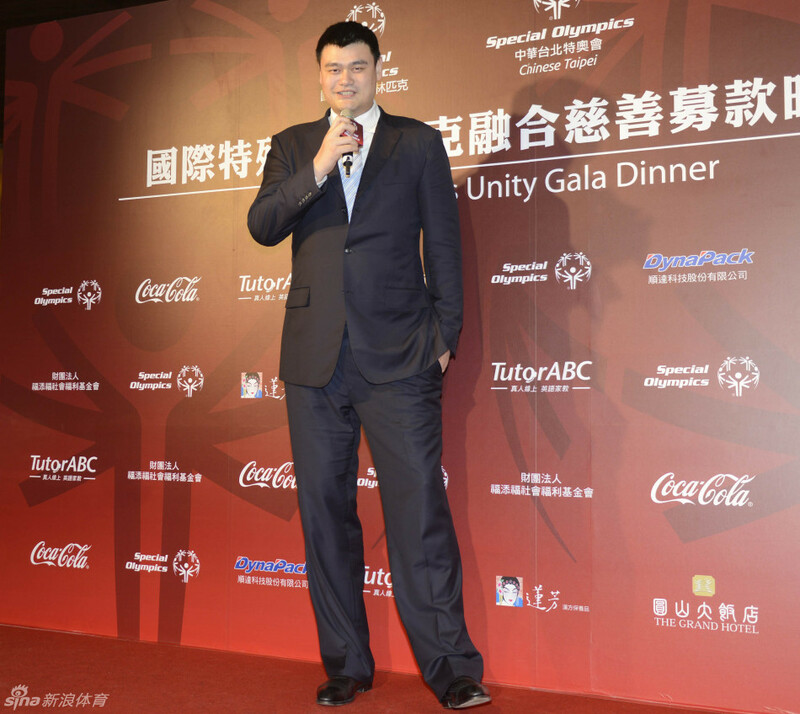 In their capacity as the Global Ambassadors of Special Olympics, Yao Ming and legendary Japanese soccer star Hidetoshi Nakata 中田英寿 were invited as special guests to help raise funding for Taiwan's Special Olympics team to attend the 2015 Special Olympics World Summer Games to be held in Los Angeles. 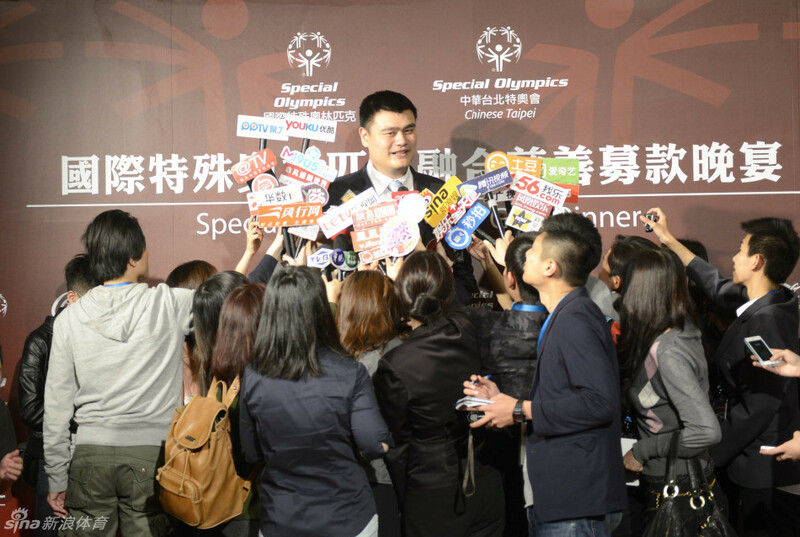 Timothy Shriver (CEO and Chairman of the Board for Special Olympics International), and Yang Yang (former Chinese short track speed skater, Olympic/World Champion and current IOC member) were also in the delegation. The delegation had a busy schedule upon arrival into Taiwan. 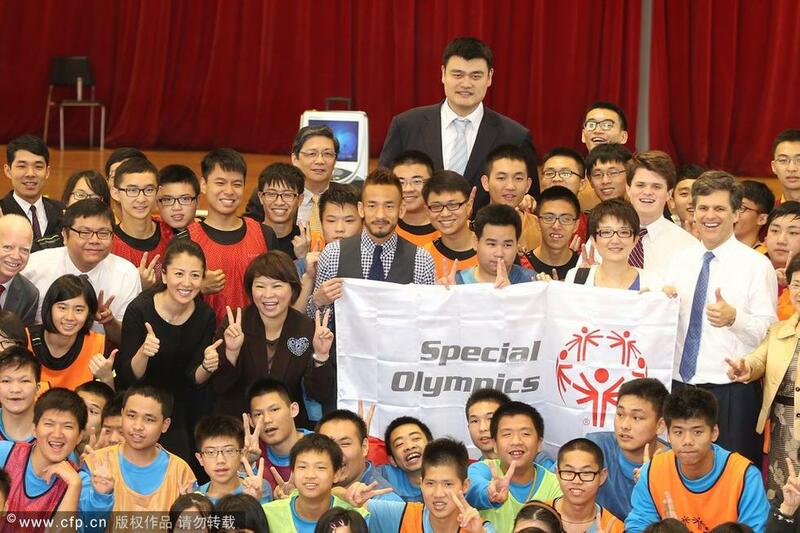 They were first greeted by Taiwan's president Ma Ying-jeou and they then paid a visit to New Taipei Municipal Special School in Linkuo in the afternoon to serve as special guests and tip-off a basketball game played by mentally challenged students. They then participated in a fundraiser yesterday evening in Taipei that was attended by local celebrities to raise funds for Taiwan's Special Olympic team. 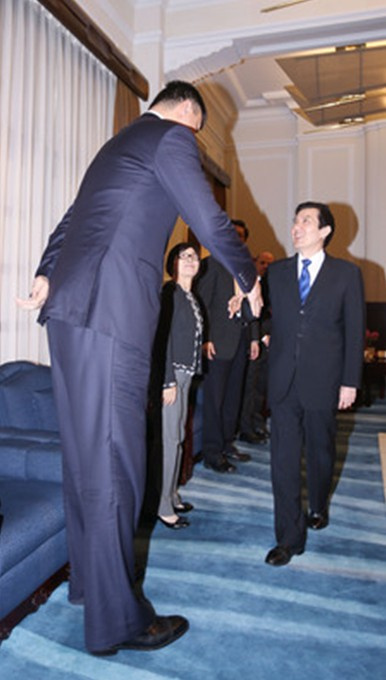 Photos of Yao Ming's busy activities yesterday in Taipei: meeting with Taiwan's President Ma Ying-jeou, appearing at the New Taipei Municipal Special School in Linkuo in the afternoon and at the gala dinner in the evening.